Dr. Booth was born in Des Moines and has lived in Iowa most of her life. After graduating from Johnston High School in 1995, she completed her undergraduate degree in Exercise Science and Athletic Training from the University of Iowa in 1999. Dr. Booth graduated from the University of Iowa – College of Medicine in 2003. She completed her residency at the University of Missouri in Kansas City in June 2007 and immediately joined West Des Moines OB/GYN. Dr. Booth became certified by the American Board of Obstetrics & Gynecology in 2009 and became a fellow of the American College of Obstetricians and Gynecologists (F.A.C.O.G.) in 2010. 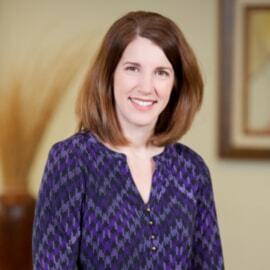 Dr. Booth and her husband have two children and live in West Des Moines. In her spare time, she enjoys running and reading mystery novels.